Preheat oven to 325 degrees. Coat a loaf-shaped baking pan with cooking spray. Set aside. Heat 2 teaspoons of the oil in a small skillet over medium-high heat. Sauté the carrot, onion, scallion and turmeric until the carrot is soft, about 5 minutes. Turn the mixture into a mixing bowl. Squeeze each piece of tofu to eliminate excess water. When tofu resembles cottage cheese, place it in a food processor or blender. Add the egg white, remaining oil, soy sauce (if using) and salt. Puree until smooth. Transfer to the bowl with the cooked vegetables. Stir in the spinach and rice. With a rubber spatula, mix until well combined. Spread the mixture in an even layer in the prepared baking pan. Bake 30 to 45 minutes or until firm to the touch in the center. Cool completely in the pan. Turn out onto a cutting board and cut into 4 squares. 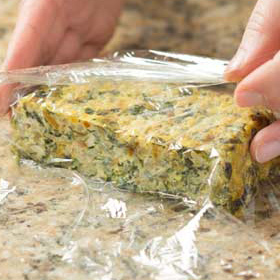 Wrap pieces individually; then place in a zip-close plastic bag and store in the refrigerator up to 3 days or in the freezer for 2 weeks. Eat at room temperature or after gently warming in a microwave. Serving size: 1/4 of recipe. Amount per serving: 153 calories, 7g total fat (less than 1g saturated fat), 17g carbohydrates, 8g protein, 3g dietary fiber, 355mg sodium.